I have always had horrifically nasty oily skin. I was a slave to oil sheets, oil-control products, oil-absorbing powder and the like. I knew that oily skin still needs moisturizer, but it seemed that whatever product I found for oily skin made the problem worse – I could not even touch a moisturizer without my face becoming an oil slick. 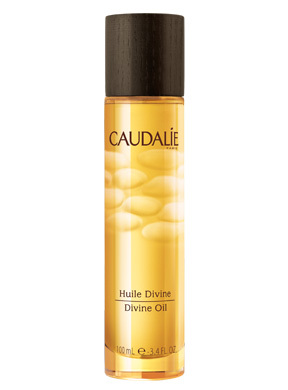 When I received a free sample of Caudalie Divine Oil in my Birchbox, I was extremely skeptical. Applying oil to an already oily face seemed so counter-intuitive to me, but I gave it a chance. After all, I’m not getting any younger and I really need to start moisturizing in addition to my anti-aging treatments. I’m happy to report that my face is now baby soft and positively glows. Just a little applied to the face is all you need – it really covers a lot and it works wonders for your skin. Packaging: Thick glass bottle with a metal pump and a heavy cap. Scent/Taste: I can’t even begin to tell you how much I love the way this smells. It smells woody and sensual and slightly floral. I would use this as perfume if I could. Bear in Mind: That this stuff rocks!!!!!!!! I Wish: Caudalie made a fragrance of this scent.